I’ve always loved butterflies. Growing up, I would tromp around our backyard looking for Eastern tiger swallowtails or their caterpillar counterpart, catching them with my bare hands, housing them in butterfly terrariums, and every now and then bringing them to my kindergarten show-and-tell. I observed them in their little bug houses with the starry-eyed curiosity and wonder of a five-year-old learning about the world intimately for the first time. I was always fascinated by their ability to completely transform from an awkward, fuzzy bug into a colorful, seemingly weightless winged creature. 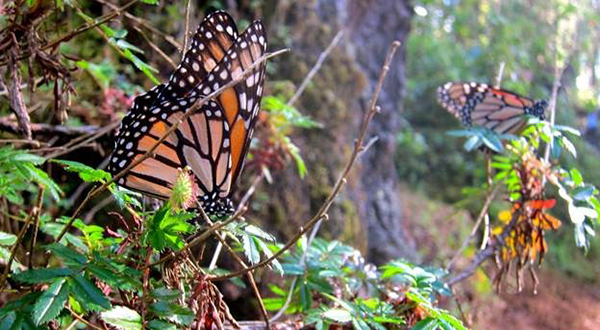 Earlier this year, I had the rare opportunity to join one of Natural Habitat Adventure’s Kingdom of the Monarchs trips. As you can imagine, I was completely ecstatic to learn about this opportunity, having fostered a love of butterflies my entire life. I started Googling pictures of monarch butterflies and reading about their history, the migration, and the importance of milkweed to their survival. I daydreamed about what it would be like to see that many butterflies at once. But all the research, daydreaming, and anticipation fell short of what it was actually like to see the monarch butterflies in person. After lunch on the second day of the trip, I found myself on a forested mountain trail in the Central Highlands of Mexico, just a few more steps away from realizing that vision. Earlier that afternoon, we had arrived at the hotel in Angangueo, which is a quaint mountain village tucked into the foggy mountains, where the cobblestone streets and building walls are covered in beautiful monarch paintings and murals, a representation of the town’s dependence on butterfly tourism. After a delicious lunch, our stomachs full of hearty Mexican food and the most incredible guacamole on the planet (not kidding—it’s actually the best guacamole I’ve ever had), we found ourselves riding in the bed of a pick-up truck, winding up the steep village roads higher and higher into the mountains, surrounded by breathtaking views of the distant mountains and farmland. Upon reaching the entrance of El Rosario Butterfly Sanctuary, we were greeted by a line of small horses ready to take us even higher and deeper into the mountains. After about a 15-minute ride, the horses dropped us off, and we hiked for another 15 minutes along a dirt trail. The buildup from truck to horse to trail had only increased my anticipation and excitement for what surely lay just around the corner. Finally, someone else in the group excitedly caught sight of the first monarch butterfly, fluttering alone through the trees. And then we saw another! And another! And ten more! We unconsciously picked up our pace a bit, excited that we must be nearing our final destination, though we still weren’t sure what that would look like. Finally, as we rounded a wide switchback of the trail, someone in the group let out a little gasp. I raised my eyes from my hiking boots but didn’t realize at first what I was looking at. As my eyes adjusted, I knew what I thought were leaves hanging off the oyamel fir trees were actually butterflies! Lots of them. Not just thousands or even tens of thousands. Millions of butterflies were hanging in clumps in the trees—so many butterflies that the oyamel branches were bent under their weight—their black and orange bodies catching the sun like fragile shards of glass. Fallen butterfly wings littered the trail, and a few solitary monarchs fluttered around our heads. I couldn’t believe what I was seeing! In short, those fragile little butterflies could pack a powerful punch. People, we’re talking MILLIONS!!!! It’s nearly impossible to mentally picture a million of anything, let alone multiple millions! It’s something that has to be seen in person in order to grasp. Photos aren’t even an accurate representation of the number of monarch butterflies that migrate to central Mexico each year. We stayed at that high point in the mountains for about an hour, all of us bundled in our beanies and scarfs and completely transfixed by the powerful sight of so many monarch butterflies in one place. I’ve always felt a little lift in spirit at the sight of a butterfly, maybe because of their fragility or their weightlessness or the way they effortlessly dance through the air. But seeing so many of them at once was nothing short of magical. And that was only the first of three incredible monarch butterfly sanctuaries we visited.